This is just a quick post to tell you about toddlers. How do I create a toddler? Hunger– another sim needs to interact with your sim and give them food or an adult can cook food and they can grab a plate. Fun– playing with toys including kiddie pool, blackboard and a sandpit! If you click on the toddler you will see the option to have birthday, only use this when you want to age them. Toddlers can interact with preteens, teens, adults and seniors, they cannot interact with babies. Can a toddler do any hobbies? Pros: I love the way toddlers walk, they are just so cute! It would be great if they could use the sink- maybe using a little stool or a mini sink for just them to use? Thanks for your blog, it really helps! Just wondering, is there a stool to get so toddlers can use the sink? Wanted to make sure I wasn’t missing it. You’re welcome! No there isn’t, I just would like one! I’ve just found your blog, I’m finding it very useful. I’ve found that toddlers will feed themselves if an adult has cooked and left the food on the counter – they just pick up the plate by themselves and sit at the table. Also, I’m finding them useful to look after pets to increase their happiness, and they can help with horses as well. Your blog is such a great tool, thanks for taking the time to write it. Just a quick note on toddler hunger: they can eat by themselves by grabbing a plate. It takes longer of course, but it is nice when you don’t have an adult available. I’ve seen references to seashell collecting and swimming at the beach? Where’s the beach? Thanks! Haven’t gotten that far. I think you blog is great because I go on here on your blog for quests all the time ever since I started playing the sims. thank you, I hope it is helping! My baby sim won’t talk to my TODDLER!!! Do you know why? Because it would be cute if they could. 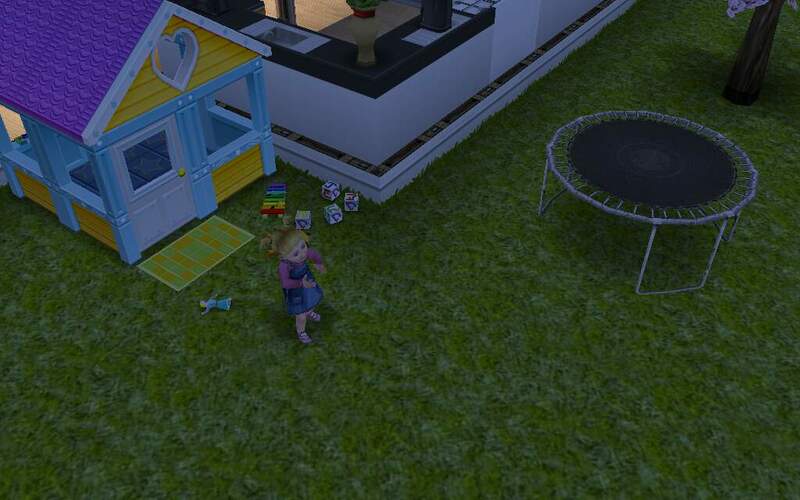 I have maxed out all of my toddler’s needs and they dont even get sad or cry. Just throw a tantrum when they are still, or get ‘housebound’. If you let them loose around the house they will act completely normal (and happy) even if they are tired, hungry, dirty and needy. EA said that the whole “senior and death” legacy was for a more realistic look at life. Then why are these toddlers always, always bubbly and happy? This is the age were parents have to be on the lookout the most… notifications saying that “your toddler knocked a credenza and is covered in glass, take him to the ER” should be part of the game. My toddler won’t tolk to the baby! Is that suppose to happen or is it a glitch plz help! Hi, just wanna say LOVE YOUR BLOG, I only use this one, not other webisites. Also, I spent a lot a simoleons on building a stable for the Need For Steed quest, and I decide to see the goals for the toddlers quest. And since we have to build the Pet Store, how do I earn fast cash? Can two toddlers interact with each other? Also wanted to say your blog is great. It has saved me lots of LP’s! Do these help tips work for the fire tablet? ?